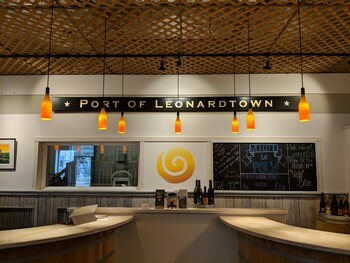 Port of Leonardtown Winery is nestled in a repurposed historic commercial building surrounded by the beautiful green space of the Port of Leonardtown Public Park. Taste our wine or simply relax on our all-weather patio with a bottle of wine and a picnic. We offer a variety of local cheeses, crackers, and meats but you are welcome to bring your own basket of goodies. Check our event calendar for special events such as music on the patio, First Fridays in Leonardtown, wine pairing dinners, and more. Our tasting room is available for private party rentals. Port of Leonardtown Public Park has a walking trail, canoe and kayak launch, picnic tables, and a gazebo. Bring your kayak, a picnic, and friends to stop by for a fun-filled afternoon at the winery. We currently offer two different tasting options. Come enjoy a Swirl Series tasting for $5.00, or a Black Label tasting for $8.00. Take home one of our souvenir glasses for an additional $3.00. Small groups of 6 or more should call in advance for reservations. Larger groups of 20 or more should call for a private tasting at least one week in advance. We can be contacted at 301-690-2192.